McDonalds will send you Angus burgers through the mail, in collaboration with none other than Facebook, according to an AdAge report. The fast food company will be the first marketer to use Facebook's upcoming geolocation feature, which is ready to launch as early as this month. Facebook is reportedly working with McDonalds to build an app that will let users check in at a restaurant and receive rewards such as coupons for featured products a few days later, say "executives close to the deal" quoted in an AdAge report. Checking in, as per geolocation 101, is the action of pinging your friends of your arrival at a certain location, be it a restaurant, bar, or cafe. Made popular by mobile services like Foursquare and Gowalla, geolocation is now said to be the next big feature coming to Facebook, making use of the millions who log in to the social network from their mobile devices. Other companies are eyeing Facebook's check-in feature in status updates also, the report rays, so we are likely to see more location-based features roll out through the year. Facebook has more than 450 million users worldwide, and around 100 million of them update their status from mobile devices. With most modern smartphones featuring a GPS chip inside, enabling geolocation check-ins, Facebook could be on to a winner with this feature. 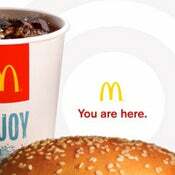 So far, Liz Gannes of GigaOm spotted a "Local" tab on McDonald's Facebook page, asking users to enter their zip code. But the main issue will be your privacy, which is at stake when sharing your location with the world. It's not clear how Facebook will integrate the geolocation feature in status updates, or what kind of privacy controls will be available.